Below you can see a screenshot in which I’ve beaten the test level (which is not that easy) by rescuing 52 kittens. It is necessary to save at least 50 and you start with 100. So that was really close. Somehow the scale2x algorithm of pygame doesn’t work as intended. Looks like I have to do it differently, maybe even scale the bitmap font beforehand. For the level design a new idea is shaping up. For a campaign mode I would like to connect separate levels with entry/exit-areas to have some Metroid-like world of single screens connected. With that approach I can place “powerups” for changing swarm density, refresh time of bait, speed, etc to make later parts of the world solvable. 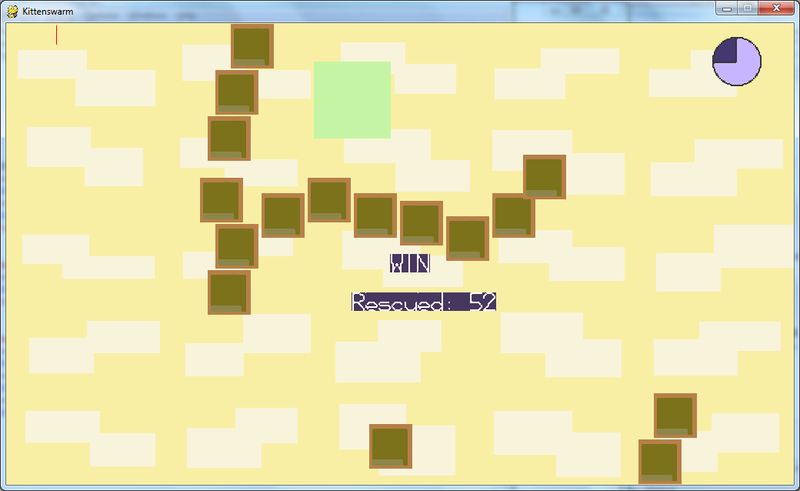 Nevertheless, next step for me is to make a level editor. Planning how it will work at the moment. So with this blog I will post development updates and other gaming stuff, especially Indie related.